H5N1 avian flu created in the laboratory. Should Research Into the Dangerous Lab-Made Flu Virus Been Classified? 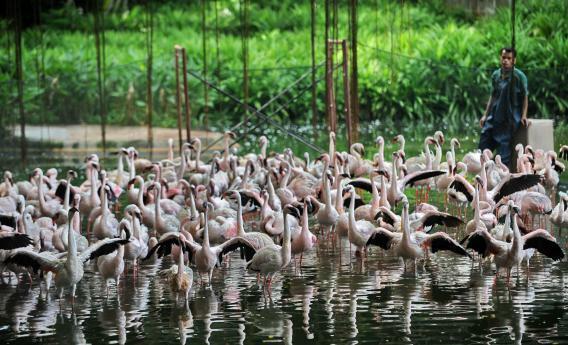 A worker keeps an eye on flamingoes to prepare for vaccination against avian flu at the Jurong Bird Park in Singapore on June 21, 2010. This week, a U.S. advisory board urged researchers and science journals not to publish detailed information about a lab-created version of H5N1 avian flu engineered to be transmittable between two mammals (ferrets, in this case)—and with a high mortality rate. The board has expressed concern that the research from the University of Wisconsin and the Netherlands’ Erasmus Medical Center could be used to create a biological weapon. In Slate today, science journalist Carl Zimmer examines whether someone really could create a dangerous bioweapon from the H5N1 research. To learn a little more, Future Tense spoke with Dr. Roy Curtiss of Arizona State University’s Biodesign Institute about what happens when scientific research ventures into dangerous territory. (Disclosure: Arizona State is a partner, with Slate and the New America Foundation, in Future Tense.) An edited and condensed version of the conversation appears below. Future Tense: Let’s start off with a basic question: Do you think that the details of the H5N1 research projects should be published? Curtiss: From my point of view, it’s irrelevant whether they publish it or not. To a scientist who’s familiar with the virology, genetics, and selection … how to do it became obvious with what was distributed two months ago. It doesn’t need the whole paper for someone to duplicate it—maybe not as efficiently, but to be able to duplicate it. Future Tense: Should the research have been carried out in the first place? Curtiss: At ASU some years ago, we had a symposium on “forbidden science,” and I made the point that there are some things that I’ve done in my life that I recognized were better left unknown, and so I’ve never communicated those to anybody at any time. In other words, I think sometimes that you can do something that is worth knowing yourself, but isn’t necessarily to be communicated to others. I think this becomes an ethical judgment. Future Tense: If there were both practical reasons behind the project and legitimate reasons to be concerned, should the research have been classified, perhaps? Curtiss: I was at Brookhaven National Lab in the ‘50s and at Oak Ridge National Lab in the ‘60s and ‘70s … and I actually would probably argue that these research endeavors should have been classified from day 1. That’s something that hasn’t come up in these discussions [about H5N1], as to whether certain types of research should or not be classified in the biological area. There may be some that are classified and you don’t know about them because they’re classified. This might have been a situation where that would have been better, but then it probably couldn’t have been done at the places it was done. … [S]ome universities have a policy [not to do] classified research. In the Second World War, a lot of universities did classified research, but then they scratched their heads and said, “This isn’t really compatible with academic freedom,” and then that kind of research was done at national laboratories and military facilities. Future Tense: Do you think that it’s actually likely that publishing the research in full could lead to someone creating a biological weapon? Curtiss: I don’t think that people who have a mindset to destroy themselves [or] anybody else … have any of the talents or wherewithal or materials to succeed in any of these endeavors any time in the next 15 years. But 15 years from now, that could become a different thing. When the atom bomb was developed, I don’t think there were too many people out there who could have scratched their heads and figured out how to do it, but now the blueprints are out there. So ultimately, knowledge will be acquired to the point where people who maybe have evil intent or whatever or unethical behavior might be able to do something. But right now, I feel quite secure and I’m very confident about the people in the field.